Sharp new observations have revealed striking features in planet-forming discs around young stars. The SPHERE instrument, mounted on ESO's Very Large Telescope, has made it possible to observe the complex dynamics of young solar systems. The recently published results from three teams of astronomers showcase SPHERE's impressive capability to capture the way planets sculpt the discs that form them—exposing the complexities of the environment in which new worlds are formed. Three teams of astronomers have made use of SPHERE, an advanced exoplanet-hunting instrument on the Very Large Telescope (VLT) at ESO's Paranal Observatory, in order to shed light on the enigmatic evolution of fledgling planetary systems. The explosion in the number of known exoplanets in recent years has made the study of them one of the most dynamic fields in modern astronomy. SPHERE is a recent addition to the VLT's array of instruments and with its combination of novel technologies, it provides a powerful method to directly image the fine details of protoplanetary discs. 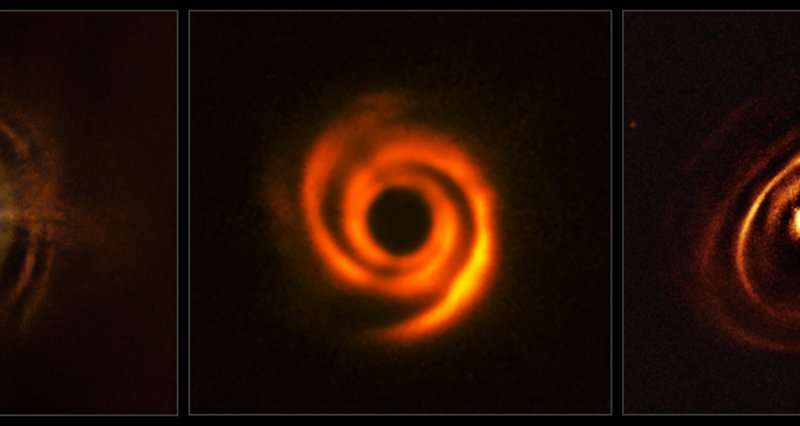 The interaction between protoplanetary discs and growing planets can shape the discs into various forms: vast rings, spiral arms or shadowed voids. These are of special interest as an unambiguous link between these structures and the sculpting planets is yet to be found; a mystery astronomers are keen to solve. Fortunately, SPHERE's specialised capabilities make it possible for research teams to observe these striking features of protoplanetary discs directly. As with the concentric rings found by de Boer and Ginski, these observations by Stolker's team prove that the complex and changing environment of the discs surrounding young stars are still capable of producing surprising new discoveries. By building an impressive body of knowledge about these protoplanetary discs, these teams are stepping closer to understanding how planets shape the discs that form them—and therefore understanding planet formation itself. More information: The research of de Boer, Ginski and Stolker and their colleagues in the SPHERE consortium is now accepted for publication in the journal Astronomy and Astrophysics. Their papers are entitled: "Direct detection of scattered light gaps in the transitional disk around HD 97048 with VLT/SPHERE"; "Shadows cast on the transition disk of HD 135344B: Multi-wavelength VLT/SPHERE polarimetric differential imaging", and "Multiple rings in the transition disk and companion candidates around RX J1615.3-3255: High contrast imaging with VLT/SPHERE". All three of papers have been created in the framework of the SPHERE GTO program, led by Carsten Dominik, University of Amsterdam. "Today it is known that planets form from vast discs of gas and dust encircling newborn stars .. Over time, the particles in these protoplanetary discs collide, combine and eventually build up into a planet-sized bodies." How is known? Where? There is only the collapse of gas in the official science (outside WDuckss). There is a classic collision of particles in the disk or ring because speeds are the same within the orbit. There is only the accretion due to attractive forces. No there is nothing chaotic, it is regulated system of speed of rotation of the central body. On the bottom of that page - ESO/VLT's press release - you can find the e-mail and phone number of the three scientists responsible for these discoveries (the fourth guy, Richard Hook, is the one who wrote the press release). Get in touch with them, ask them your questions and please, do let us know their answers. But really do it. It seems you are always doubtful and sceptic about what astronomers discover and how they come to their conclusions. This is your chance to get to the bottom of it. By going directly to the source. To add to setnom's comment. Much of the research that you are asking about is referenced in the introduction of the paper(s) associated with the article above. The main article can be found at: https://arxiv.org...27v1.pdf . The other associated articles are referenced within. Since 2004 I am imparting knowledge about this matter, younow mentioning 2016. Where you sleep ten-year dream? Your memory lasts a few days or months and is very selective. "The first step in this circle is the appearance of matter ... There are neutrinos, electrons, protons, ... In the process of joining ever larger objects appear by gathering together these elements. Then there is a formation of stars, which , finally, turn into novas, ie, they explode and return into the state of the elementary matter. " 2010.y. You are NOT "imparting knowledge". You are trying to sell an unsubstantiated, and frankly ridiculous, world view. Nobody will take you seriously until you start trying to provide evidence for your claims (N.B. your BELIEFS do not constitute evidence). The scientific journals have accepted the evidence, only you blabber "Nobody will take you seriously until you start trying to provide evidence for your claims"
"International Journal of Scientific & Engineering Research -IJSER (ISSN 2229-5518)"
13 papers in Academia.edu https://independe...erDuckss (including internal and Universe 2010). etc. So, nobody is going to be impressed by what amounts to nothing more than unsupported opinion. Secondly, if you have the knowledge you claim to have, why do you never provide any support for the innumerable claims you make on this site? I really love the "I DISCOVERED THE ORIGIN OF UNIVERSE" paper. Thanks for reminding me of that one. It is so goofy and I can't stop laughing at the napkin drawings of everything. You obviously credibility agree only prescribed works and plagiarism. For you are scammers the authors of the original articles while are lauded plagiarisms and plagiarist who publish in (your) "credible" magazine. In this article are published my data that are author work and publicly declared in a number of sites and magazines. Of course, you represent exclusively copyists and trying to legalize them (in vain job).